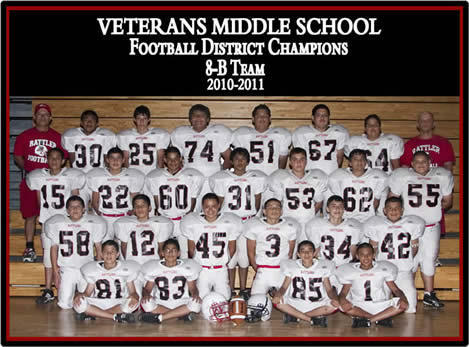 VETERANS MIDDLE SCHOOL – Congratulations to the VMS 8th Grade “B” Football Team for earning the Football District Championship title for the 2010-2011 school year! Football players on the championship team included (Bottom Row L-R) Estevan Sepulveda, Benny Benavidez, Justin Guerra, Jeremy Barrera (Second Row L-R) Kevin Barrera, Pedro Morin, James Lopez, Bryan Villarreal, Derek Ruiz, Jose Briones (Third Row L-R) Carlos Lopez, Eduardo Rivera, Juan Gamez, Julio Garza, Garrett Gonzalez, Jay Alvarez, Angel Jaramillo (Top Row L-R) Coach Jesse Salinas, Mario Sosa, Luis Salinas, Ryan Salinas, Jose Sanchez, Omar Guerrero, Lee Rivera, and Coach Marcus Perez. A special recognition of gratitude is extended to the parents, community, coaches, and students for their support and dedication to our school.